This is distressing . . . – Screen printing product and technical news from Stanley's, Canada. This is distressing . . .
It’s a bit of a paradox — fashionable elegance apparently requires inelegance. I’m referring to the increasingly common sight of jeans abraded, ripped, and torn until, in some cases, there’s more leg than denim on display — the epitome of inelegance, one would have thought. But this is the distressed trend in fashion. Textile screen printers have been printing “distressed” designs for many years but “distressed” now encompasses garments too, not just prints. As a smaller textile shop accustomed to catering to a local market and willing to do labour-intensive work frowned upon by big production-oriented shops, you may be able to create a niche in your local cap market. 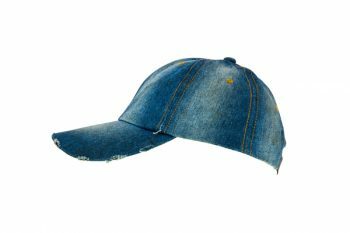 Distressed fashion now includes caps. All you need to distress a cap (a vintage style cap works best) is a Dremel tool with a wire brush attachment, coarse sandpaper, a pair of scissors, and a thread un-picker. You can then do to a cap in a few minutes what regular wear could take years to achieve. It doesn’t matter why people would pay good money for a new cap that looks like an old cap, but while they do, you may as well take advantage of it. This entry was posted in General interest on November 30, 2017 by Michael Best - Stanley's blog editor.